The standard in excellence for lifelong learning. MKSAP 18 Complete is now available. Help identify learning gaps, stay current, and gain knowledge. Updated content, all-new MCQs & exciting new features. Widely considered the go-to source for ABIM exam preparation. Various formats available to meet your needs. Since 1967, the Medical Knowledge Self-Assessment Program (MKSAP) has been the most trusted resource in lifelong learning for internal medicine physicians and residents. The tradition continues with MKSAP 18. The Medical Knowledge Self-Assessment Program® (MKSAP) has been the “go-to” resource for board prep and lifelong learning since 1967. The Best is Always Better! As a comprehensive learning management system, MKSAP 18 remains the standard in excellence for equipping residents and practicing physicians with the information they need to stay current in medicine and prepare for their board exams. With “New Info Updates,” MKSAP 18 Digital will be regularly updated to reflect practice-changing information, guidelines, and expert recommendations. Physicians can develop a customized learning strategy with custom quizzes or flashcards, or focus learning on high value care or hospitalist-specific content. Board Prep for ACCGME-accredited osteopathic programs. MKSAP 18 will help residents in ACGME-accredited osteopathic programs prepare for the ABIM Certification exam. Whether for the ABIM’s traditional 10-year MOC exam or the new Knowledge Check-in, practicing physicians can continue to rely on MKSAP to help them develop an effective study strategy while also earning MOC points. MKSAP offers a value-packed learning management system for one subscription price with no renewal fees and unlimited opportunities to clear your answers. With a comprehensive syllabus text, an extensive Q-bank, hundreds of high value care recommendations, specially highlighted hospitalist content, carefully crafted tables, custom quizzes, progress reports, CME certificates, and more, MKSAP offers the most learning for the most value. Developed by more than 100 experts in the subspecialties of internal medicine, each new edition is completely rewritten every 3 years. Each new MKSAP edition stands on its own, with 100% of the text and MCQs written from scratch to provide you with the freshest information to inform your learning. MKSAP content development is a painstaking three-year process involving multiple stages of writing and rigorous review by our 11 committees and peer reviewers, encompassing more than 200 expert subspecialty physicians. MKSAP contains clear, evidence-based discussions of core internal medicine concepts to help you deliver the best patient care. Whether you are focused on ambulatory or hospital-based medicine, preparing for your boards, or are a subspecialist trying to keep up-to-date in other subspecialty areas of internal medicine, MKSAP provides a targeted solution for your needs. MKSAP 18’s summary key points, blue hospital-focused text, high value care recommendations, incisive summary tables, and dynamic 4-color images accentuate the layout, enhancing readability. 1,200 all-new, board-like, self-assessment, MCQs to help you smartly prepare. Easily identify relevant content, prep for the FPHM exam, and more. Practice exam, custom quizzes, ongoing content updates, and more. In addition to updated content and all-new MCQs, MKSAP 18 has added exciting new features. MKSAP 18’s digital flashcards, included with MKSAP 18 Complete, have been enhanced with adaptive learning technology to help reinforce knowledge through repeated exposure to incorrectly answered flashcards. Customize your learning based on your areas of need using the MKSAP 18 digital flashcards. MKSAP 18 Digital’s platform is built using the newest technology to run efficiently on the most current operating systems and computers. With a streamlined dashboard and navigation tools, you are able to easily pick up where you left off when logging back in. The Progress Meter provides a visual snapshot of how many questions you have answered in each section. Turn on Night mode in MKSAP 18 Digital to change the luminosity on the screen. Night mode helps to reduce the glare and increase readability in all environments without straining your eyes. Your go-to source for ABIM exam preparation. More than 94% of Internal Medicine residents use MKSAP to prepare for the Boards. Whether preparing for the ABIM certification exam or the MOC exam, study confidently with MKSAP! For an intensive ABIM board review, count on the 350-page Board Basics text, filled with crucial internal medicine material you should review right before taking your exam. Review hundreds of quick-study concepts for the Internal Medicine Board Exam in a mobile-friendly format. This new edition of the online, image-based self-assessment program provides 400+ questions that are fun and challenging. MKSAP 18 is available in several flexible formats, allowing you to choose the format that best fits your lifestyle. 11 concise subspecialty sections and 1,200 associated MCQs. MKSAP 18 delivered in a state-of-the-art format with content updates and other exclusive features. Print and Digital, plus Board Basics, digital flashcards, and Virtual Dx. Multiple Copy Order Form – Save 10% when you order 10 or more copies of MKSAP 18. Purchase MKSAP 17. Earn MKSAP 17 Part A CME/MOC until July 31, 2018. Earn Part B CME/MOC until December 31, 2018. With MKSAP 17 Digital or Complete, you can keep earning CME/MOC by using the MKSAP 17 Updates through January 15, 2021. Purchase MKSAP 18. MKSAP 18 Part A will be available July 31, 2018 (print)/August 31, 2018 (digital/Apps); Part B will be available December 31, 2018 (print)/January 31, 2019 (digital/Apps). Earn CME/MOC until July 31, 2021 with MKSAP 18 Part A. Earn CME/MOC until December 31, 2021 with Part B. With MKSAP 18 Digital or Complete, you can keep earning CME/MOC by using the MKSAP 18 Extension Questions through January 2024. Prepare efficiently. Derived from MKSAP’s 11 subspecialty text sections, MKSAP's 1,200 self-assessment questions feature one-best answer clinical scenarios that are relevant to your practice. Plus, MKSAP's questions cover the same topics covered in the ABIM exam blueprint to help you smartly prepare. Experience unsurpassed question-writing excellence. A tremendous amount of effort goes into developing MKSAP's board-like multiple-choice questions, written by a team of 11 expert subspecialty committees using the highest standards in question writing. Each MKSAP self-assessment question is pretested and psychometrically validated to ensure it is well-structured, accurate, and fair. Study with a variety of MCQ formats. Depending on the format you purchase, MKSAP 18 offers variety in both numbers and types of questions, including traditional self-assessment questions, Bonus Update Questions, Virtual Dx (image-based) Questions, and flashcards (one question/one answer questions). Get the best value with MKSAP 18 Complete! Trust MKSAP 18 to keep you up-to-date in hospital medicine and meet your requirements for the ABIM Focused Practice in Hospital Medicine program. MKSAP is a comprehensive learning solution to keep you abreast of important information in the hospital setting and to help you pass the FPHM MOC exam. NEW! MKSAP 18 Residency Tracker helps educators easily assess their residents' progress, create assignments, and customize learning. Available with MKSAP 18 Digital or Complete. To take advantage of these MKSAP 18 Digital or Complete exclusives, order MKSAP 18 Digital. CME credits for MKSAP 18 are available only if you purchase the MKSAP program directly from ACP. CME credits and MOC points cannot be awarded to those purchasers who have purchased the program from unauthorized sellers such as Amazon, eBay, or any other such online retailer. MKSAP 18 Part A and Part B, the MKSAP 18 Extension Questions, and Virtual Dx (available as part of MKSAP 18 Complete) have been approved for CME credits and MOC points through the eligibility periods outlined in the charts below. Learn more about using MKSAP to earn MOC/CPD internationally by visiting the MKSAP Resource site. Earn up to 5 AMA PRA Category 1 Credits™ and/or MOC Points with each set of Extension Questions. MKSAP 18 is specifically intended for physicians who provide personal, nonsurgical care to adults. Specifically, general internists and primary care physicians, subspecialists who need to remain up-to-date in internal medicine, residents preparing for the Certification Exam in internal medicine, and physicians preparing for the Maintenance of Certification Exam in internal medicine. Close gaps between actual care in your practice and preferred standards of care, based on best evidence. Diagnose disease states that are less common and sometimes overlooked and confusing. Improve management of comorbid conditions that can complicate patient care. Determine when to refer patients for surgery or care by subspecialists. The American College of Physicians designates this enduring material, MKSAP 18, for a maximum of 275 AMA PRA Category 1 Credits™. Physicians should claim only the credit commensurate with the extent of their participation in the activity. The American College of Physicians designates this enduring material, MKSAP 18 Bonus Questions, for a maximum of 20 AMA PRA Category 1 Credits™. Physicians should claim only the credit commensurate with the extent of their participation in the activity. Successful completion of the CME activity, which includes participation in the evaluation component, enables the participant to earn up to the number listed below if medical knowledge MOC points and patient safety MOC credit in the American Board of Internal Medicine's (ABIM) Maintenance of Certification (MOC) program. It is the CME activity provider's responsibility to submit participant completion information to ACCME for the purpose of granting ABIM MOC credit. CME credits and MOC points are available March 29, 2019 to March 29, 2022. Virtual Dx is intended for physicians who provide personal, nonsurgical care to adults. Specifically, general internists and primary care physicians, subspecialists who need to remain up-to-date in internal medicine, residents preparing for the Certification Exam in internal medicine, and physicians preparing for the Maintenance of Certification Exam in internal medicine. Recognize visual presentations of common and rare conditions. Increase skills in interpreting image-based findings. The American College of Physicians designates this enduring material, Virtual Dx for a maximum of 10 AMA PRA Category 1 Credits™. Physicians should claim only the credit commensurate with the extent of their participation in the activity. Count on Board Basics for an intensive ABIM Board review. Board Basics is derived from MKSAP 18 content, but presented in a succinct digest style with key facts, tables, and test-taking tips to help you pass your Boards. Available in print format with accompanying e-book. 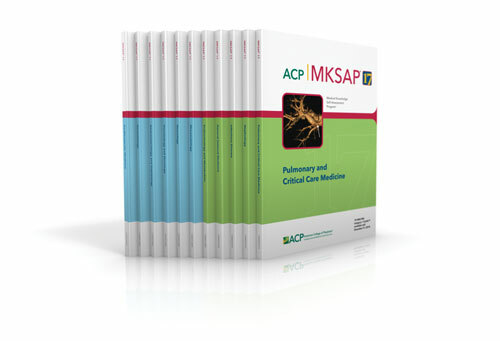 Board Basics is included for free with your purchase of MKSAP 18 Complete or if you are an ACP Resident/Fellow Member purchasing any MKSAP 18 format. MKSAP 18 Print or Digital subscribers can purchase Board Basics as an enhancement for $119. With 1,200 "byte-sized" questions, the MKSAP 18 digital flashcards help you review for the Internal Medicine Board exams. New for MKSAP 18! Let our new adaptive learning technology strengthen your learning with re-exposure to flashcards you’ve answered incorrectly. For free access to the MKSAP 18 Digital Flashcards, order MKSAP 18 Complete. This new edition of the online, image-based self-assessment program is both fun and challenging. To get free access to Virtual Dx, order MKSAP 18 Complete. We will send you a full refund on your purchase price of MKSAP if you have answered all 1,200* self-assessment questions and submitted for CME (to verify completion) but still do not pass the ABIM exam. IMPORTANT: The date of CME submission for all 1200 self-assessment questions must be prior to your ABIM examination notification of failure. *All 1,200 questions must be completed and submitted for CME or CME and MOC to qualify for refund. No exceptions. View the table of contents and sample Text and Questions pages from each section in MKSAP 18. MKSAP 17 Print includes 11 subspecialty books which can be used to update knowledge, prepare for the Board exams, and to earn CME credits & MOC points. Board Basics (in print and e-book) is included for free with every MKSAP 17 purchase by an ACP Resident/Fellow member. Other MKSAP 17 subscribers can purchase it for $109. MKSAP 17 Digital is the most convenient way to prepare for the internal medicine board exam. Its mobile-friendly online format and flexible offline Apps offer many special features to personalize and enhance your learning experience. MKSAP 17 Digital continues to provide you the ability to create custom quizzes in study mode or exam mode, track your progress, check peer statistics, and view related content or questions. Extend the life of your CME & MOC through January, 2021 with automatic delivery of the MKSAP 17 Updates — no need to purchase them separately. Take the new Pretest to establish baseline knowledge gaps to develop your study plan. Simulate the exam experience with the new Practice Exam. Easily access "recently viewed" content so you never lose your place. View tables, figures, and questions in line with text or in a separate window, depending on your preference. Review content flagged for Hospitalists across all specialties. Access High Value Care recommendations. Enter notes as you work through the program and star questions you would like to revisit. Earn CME online and offline with MKSAP 17 Complete, an integrated learning system for a variety of your professional needs. Offers the full range of resources at the absolute best value!